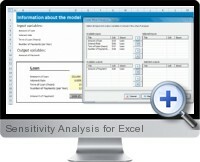 Sensitivity Analysis for Excel is a powerful and simple to use tool for performing sensitivity analysis on Excel models. Results can be obtained through three possibilities: tornado analysis, spider analysis and sensitivity tables. A wizard which is intuitive and easy to use. 100% integrated with Microsoft Excel. Intuitive and easy to interpret reports. Automatic detection of variable headings. These charts show a graphical representation of the changes produced in the target optimal solution or function whenever a specific quantity or value in a model’s parameters changes in a constant proportion. This type of analysis makes it possible to make variations (by percentages) in the same amounts for all input variables. Tables showing constant variations of each input variable (defined variations with a base value, an increase value and a ceiling) and the effect of such changes to changes to output variables.